Knitters have a bag or box of knitting tools: tape measures, stitch holders, stitch markers, bobbins, scissors…. 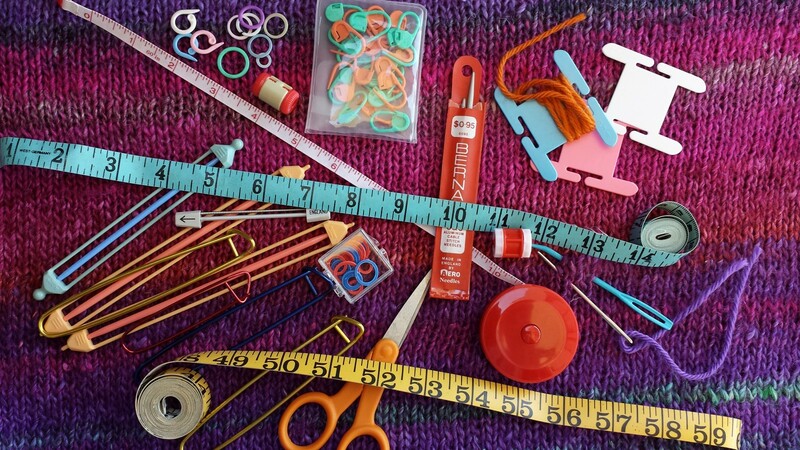 Other useful knitting tools are tips and resources to help you become a more confident, more creative, more knowledgeable knitter. Click on a link below to learn how. Submit your suggestions for free and non-commercial knitting tips, tools and tutorials here. Ravelry is the largest online community of knitters and crocheters with over four million registered users. It is difficult to explain the magnitude of this wonderful knitting community. Visit and see if you agree. You can start by visiting the SDNCKG Ravelry group. Another excellent on-line knitting place is Knitty. There are patterns, technique tutorials, history, and yarn reviews. Vintage knitting patterns from the 1940s are available from this free digital archive. Let’s start knitting some fishnet stockings! Visit the Victoria and Albert Museum on-line for this and other fascinating patterns. Our Guild is not affiliated with The Knitting Guild Association but you can visit their website to find local guilds when you travel, to take classes and to connect with other knitters. TechKnitting is a superb source for detailed instructions for techniques to “turn HOME MADE knitting into HANDMADE knitting.” The illustrations are amazing. Yarn Sub is the site to visit whenever you contemplate following a pattern but substitute another yarn. Consult the Craft Yarn Council whenever size matters. Use knitters graph paper to design your pattern. Knitters graph paper more accurately reflects your different row and stitch gauges (having rectangles rather than boxes) so you get a more accurate reflection of your stitch pattern whether it is colorwork or texture. Another site for knitters graph paper. Adding stripes to your knitting? Use this random stripe generator. Create a knitting chart at stitchfiddle! Fair Isle, intarsia, duplicate stitch. Lace, bobbles, bricoche. Your chart is here. Need to translate a foreign language pattern into English? Need to know a lace pattern with a specific number of repeat stitches? Knitting Fool has knitting creative and original resources. Convert an image into a knitting pattern with Pattern Wizard. Consult this review of knitting needles before you add to your collection. Make your own blocking wires. Here’s a concise summary of 25 tips to make you a better knitter. Find helpful tips, musing with meaning and knitting inspiration at Mason-Dixon Knitting. Finish your knitting beautifully with a Bias Bind-Off from CocoKnits. Learn to knit stacked stitches and other cool techniques (think Fox Paws) from Xandy Peters (on her YouTube channel). Well-done video tutorials included knitting an integrated i-cord by Carol Feller. More musing about a knitting life from Stephanie Pearl-MacPhee. Wooly Wormhead has detailed tutorials on many useful techniques–casting on for 2×2 ribbing, for example. Lorilee Beltman told us about a cool website called tracingrealbodymodels.org. It’s a big help when designing for real bodies. She downloads the drawings and prints them at about ten percent opacity. That way there is enough to see while she draws on top. Manage the tension on a finished edge with Jeny’s Surprisingly Stretchy Bind Off. There are many provisional cast-on methods. Here’s one using a crochet hook. Do you have a favorite method? Send it and we’ll add it here. Use a three-needle bind off to join two pieces of knitting. Short row shaping from Kelbourne Woolens. Free video tutorials from Myra Wood including short rows, circular cast-on for shawls and doilies, Magic Loop for center-out knitting, and easy nupps. Knitting from the beginning! Learn how to hold your needles and yarn without needing a third hand. Learn how to make a slip knot and put stitches on a needle. Learn the knit stitch and the purl stitch. Learn the difference between garter stitch fabric and stockinette fabric. Here are some links to written and video tutorials, basic patterns and instructions for basic techniques. Send us info that helped you so we can add them to the list to help others.